Now is a great time to gaze into our dark skies and to contemplate the Milky Way, our home galaxy. After twilight ends on late September evenings, the luminous band of the Milky Way stretches from the southwest to overhead and beyond, into the northeastern sky. To the southwest in the direction of Sagittarius, the Milky Way’s clouds of stars and glowing gas are brightest. This is the direction of the galactic center, where stars are most concentrated. As we trace the Milky Way from overhead in Cygnus and into Perseus in the northeast, we are looking away from the center, where stars and gas are sparser. Because we live within it and because our galaxy contains dust that blocks visible light, it’s taken nearly a hundred years for astronomers to map its structure and size, and many details are still unknown. But, based on recent infrared and radio studies, astronomers have found that the Milky Way consists of a flattened disk of stars, gas, and dust that spans about 100,000 light years. If you prefer that distance in miles, multiply 100,000 by 6 trillion! 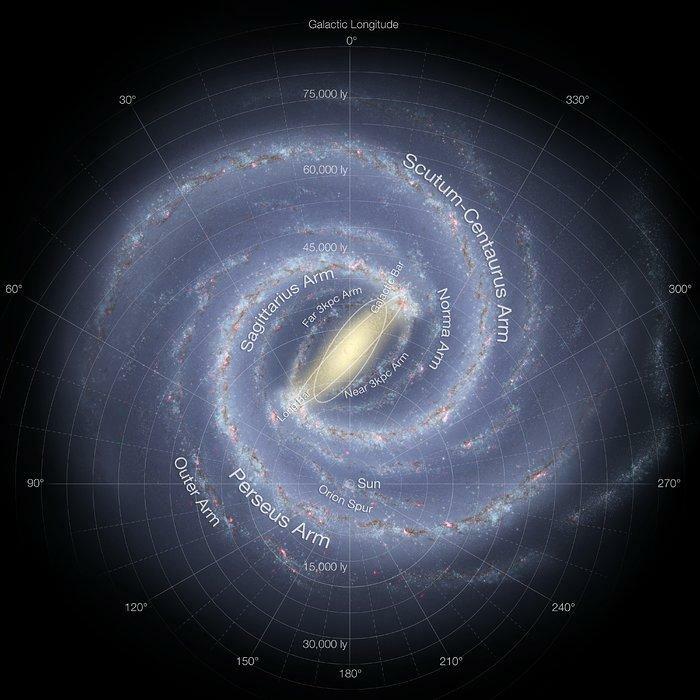 From the Milky Way’s central bar or bulge, several spiral arms extend outward. Our solar system is located about 26,000 light years from the galactic center, along a spur that branches from one of those main spiral arm. Using binoculars on a clear and dark September night, we can see many tens of thousands of stars in the Milky Way. But astronomers estimate that our galaxy actually contains between 200 billion and 1 trillion stars, and perhaps that many planets. We truly live in an amazing place!